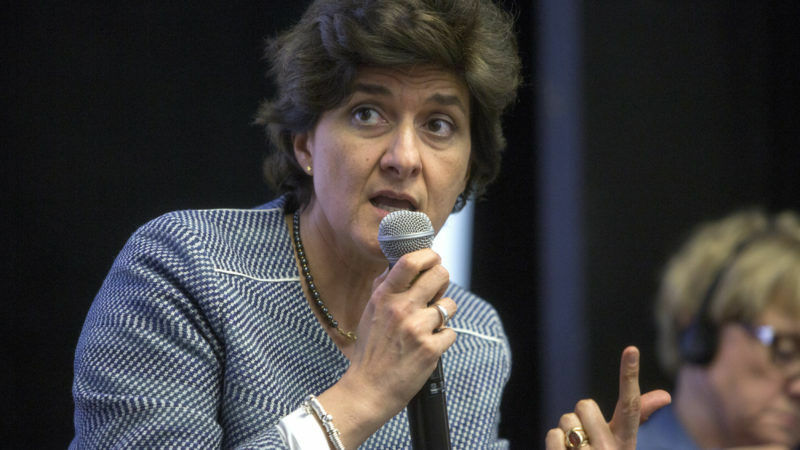 Sylvie Goulard is a centrist liberal MEP and member of Macron’s En Marche campaign; she is contributing to the development of his European policy. Did the voters who chose Emmanuel Macron in the first round of the presidential election choose him above all as a pro-European candidate? For his supporters, and probably his voters, Europe was an important factor. For years, the traditional parties have left the subject unaddressed. Even in the moderate parties we hear anti-European voices, and these are very loud on the extremes. Of course, voters may not agree with everything we say about Europe. Similarly, the anti-European discourse may not be the driving force behind the support base for extremist parties. Voters want to upset the milk cart, but this is a reaction against the elites, the rich and globalisation. What about the outgoing president’s record on European issues? France played a significant role when it came to Greece. Germany set tough demands and France allowed Greece to stay in the eurozone. Then there are the Minsk Agreements, the fight for peace in Ukraine, for which we have to give credit to François Hollande. But this is all crisis management. Overall, it is not just in the last five years but over the last 25 years that France has failed to carry the torch of the European project. What has caused successive plans to reform Europe to fail? Member states. We have to accept the fact that certain problems are resolved by transferring sovereignty. This is the case with border controls, for example. We cannot control the external borders without a common border force. The capitals have long refused to cooperate but the idea is finally back on track. If you look at France, which did not celebrate the 60th anniversary of the Treaty of Rome, you would be quite right to ask what they were playing at. We don’t allow people to understand Europe. Europe also lacks emotion, individuals who are able to communicate human messages, Europeans who can bear witness to their own experience of Europe. For example, Emmanuel Macron said he comes from a region full of cemeteries, for which “the history of France was a valley full of tears” before European integration. Peace is the ultimate aim of the European construction. Many European capitals have reacted optimistically to the first round of the presidential election, particularly Berlin where both major parties appear to support Macron. Is this not a bit dangerous? We must remain modest until the people have voted. Whatever the result, the future president will have to deal with a fragmented, scarred country and an idea of Europe that has taken a battering. Through En Marche, we hope to reform Europe. And that is part of what interests our European partners. So it would be great news if Macron were to win. But don’t forget that there are 27 countries in the EU: there is a long road ahead of us. Should the focus be on restoring France’s image, which has suffered at the European level? If we want influence, we have to work and fight double-talk. Some parties say they are pro-European, but their leaders don’t spend enough time on the matter. It is scandalous that the French parties have ignored the European Parliament as an influential institution. At Competition Commissioner Margrethe Vestager’s hearing, two-thirds of the German and Italian members were there but I was the only French MEP, despite the fact that competition policy is a major debate in France. Many people in France have wondered whether En Marche will be able to form a workable majority in parliament. If elected, how will Macron govern France? I think the future will be one of coalition governments. The era of huge parties stuck on fixed ideologies is over. Our societies are more fragmented and people are more educated. Coalitions exist in Italy, Germany and the Netherlands. A French coalition will not be a 200-page document negotiated down to the last comma, like in Germany, but a short and simple shared mandate: social justice in the eurozone; the energy transition; the fight against terrorism; culture; education. In the European Parliament, we challenge each other’s ideas and make concessions. It’s a way of ensuring that half the countries involved don’t just sit down in the middle of the road and block everything. What European issues are priorities for Macron’s team? Nothing institutional; (we need to) bring a human touch back into the European project. The Treaty of Rome commits to improving the lives of Europeans. It is a social and economic project. In a globalised and open world, we need measures that protect people, that oversee taxation, but we also need to achieve conditions whereby more people can be integrated into the labour market through greater flexibility. Secondly, we need to guarantee the security of European citizens. Externally, through defence, and internally, in the fight against terrorism. Finally, the question of refugees has to be re-examined. There are other ways to organise solidarity. The countries of the Global South should not be alone on the front line and we must get better at organising our reception areas. Some countries, like Canada, have mobilised their citizens to host refugees. We have to involve the people, the local authorities, and not leave it up to the European institutions. And what if Macron, a Europhile, fails to ‘change’ Europe? What then? Oh, but we will succeed! I have absolutely no doubt about that. The European machinery is currently at a standstill because there has been no motor (driving it). If countries of a sufficient size really commit, with optimism and people that believe, it will work. Step by step, we have to work towards the goal of shared sovereignty. We will reach a positive, result for the collective. Not necessarily what we had in mind at the beginning. But there is a lot of good will throughout Europe that will help us. Well a, does she have a crystal ball, b, does she mean europe or the eu the two are not interchangeable terms, c, There isn’t a european parliament only an eu one. d, the treaty of Rome created erratum hardly with a view to improve anyones lives. Europe will be here long after the EU has been forgotten. I agree with Goulard. If Macron can make France shake it’s torpor and fully engage with the EU, then Europe has a bright future ahead. This could well turn out to be the catalyst that has been missing so far. Where one sets an example, others will follow. We always thought the leadership would come from Britland- but now they’ve gone and faded away it’s France that will take the lead. En Marche, indeed. We will follow. To where? He is an empty suit full of sound and fury signifying nothing.